Kenji Sawada. Keiko Matsuzaka. Shinji Takeda. Naomi Nishiba. Tamaki Miyazaki. Tetsuro Tanba. Kiyoshiro Imawano. Art House. Comedy. Musical. Dave T's Platinum Picks. 01 Nigel's Choice. Dance. Recommended. Miike Takashi returns to mess with your minds! 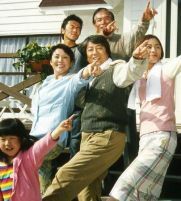 The plot revolves around a family who have set up a guest house in the picturesque countryside in anticipation of an influx of tourists due to a new road under construction. Things soon start to go awry when the first guest dies and the family decide to bury him to keep the prospects of their business alive. The plot, however, soon takes a back seat to the audio-visual assault on the senses that follows. Musical numbers are played out with gusto from the excellent cast, mixing genres as they go. The animated sequences borrow heavily from Jan Svankmajer's style and allow for some great surreal plot developments as well as adding to the general sense of manic confusion. Due to the pastiche style of the film, many other films are alluded to, to the assured delight of movie lovers. The Sound of Music is obviously a big influence, with West Side Story, Dawn of the Dead and even Nick Ray's classic Johnny Guitar being alluded to. But what's the point in trying to lead you through this film? Turn off the lights, get your Rizlas out and open your mind!